We love that brides and bridesmaids are planning creative bachelorette parties that fit the bride and her unique personality! A bachelorette party doesn’t have to be a night out drinking if the bride hates the bar scene. 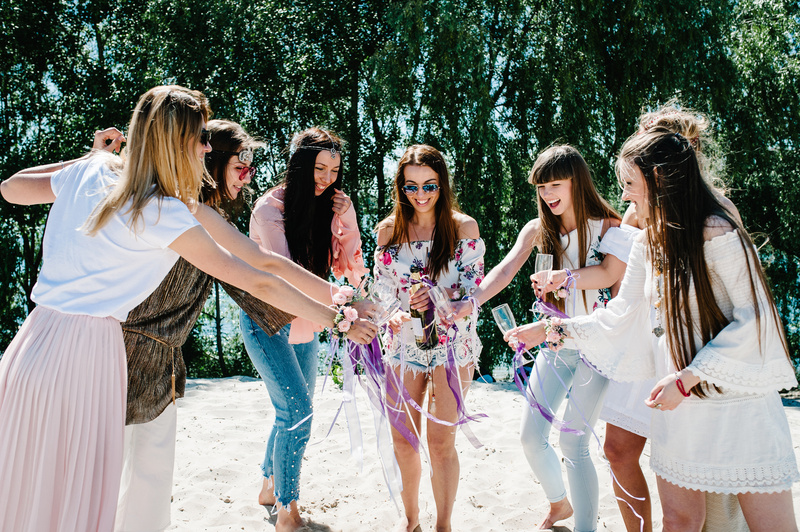 There are SO many creative bachelorette party ideas, but here are 7 of our favorites! A theme isn’t necessary for a bachelorette party, but it can definitely jazz things up! A few of our favorites right now are tropical, final fiesta, champagne showers.. the possibilities are endless! Create many chances for guests to create insta-worthy memories with a photo backdrop, props, and the perfect decor. As the planner, you’ll want to make sure you’re taking pics for the bride so she can focus on having the fun! On that note, if you really want to make sure you get the perfect pictures you might consider having a professional called in. No need to have them available all night, just schedule a little photo shoot for the beginning of the festivities to make sure you get some non-blurry, frameable pictures! Get creative here! Whether it’s fun matching t-shirts, a color story, or having the ladies dress to match your theme, you’ll want to call out a dress code for this event. Again, this helps create amazing photo ops, and sets the tone for the bachelorette party itself. Even if you’re staying local, an Airbnb allows the party continue as a mass sleepover after the bachelorette festivities. You can book a gorgeous home or apartment, and split between the group this option is likely going to be (lots) cheaper than a hotel suite or 2! The hottest trend in bachelorette party decor? Balloons. Get a giant ring, spell something out, or simply buy a bunch! Balloons are sure to delight all your bachelorette party guests. As fun as the goofy party favors can be, opt for something you know the ladies will actually love and use! We are big fans of this creative bachelorette party gift box filled with accessories and personal care items the girls will for sure make use of. Ready for more ideas for creative bachelorette parties? Head over to see our 5 favorite free apps for bachelorette party planning!